CD46 is a protein that was first identified as binding to complement, an important system of the innate immunity involved in killing pathogens and foreign cells. It has since been described as a receptor for many pathogens, including viruses (i.e. MV, HHV6…) and bacteria. When CD46 is activated in human T cells, the cells grow and become regulatory T cells as they keep in check the activation of other T cells. In particular, they release some IL-10, a potent anti-inflammatory molecule that suppresses other cells. Multiple sclerosis (MS) is a chronic inflammatory disease, involving inflammation in the brain. This complex disease involves multiple aspects (immunologic, genetics and environmental), and the understanding of MS pathogenesis is far from complete. 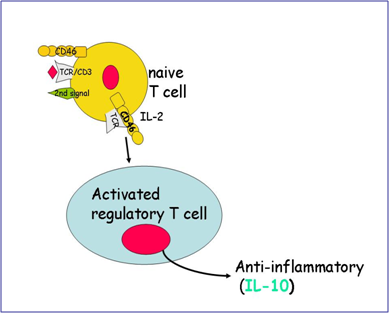 In most patients with MS, the release of IL-10 upon CD46 activation is impaired. No IL-10 (or much less) is produced by T cells from patients compared to T cells from healthy donors. CD46 function is also altered in dendritic cells (DCs). These cells initiate the immune response. 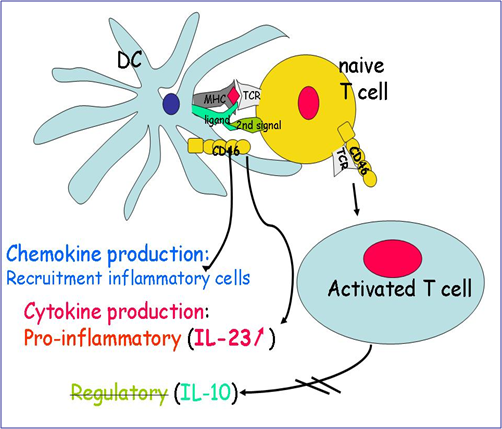 DCs from patients secrete more pro-inflammatory molecules than healthy donors (IL-23 as well as chemokines that attract other cells to the site of inflammation). Hence, CD46 regulates inflammation and may be involved in MS pathogenesis.